This Girl Can is our nationwide campaign to get women and girls moving, regardless of shape, size and ability. Sport England research reveals a huge difference in the number of men and women playing sport. And it’s not because females don’t want to get active. Millions of women and girls are afraid to exercise because of fear of judgement. The campaign has clearly captured a nerve, with over 13 million people having now viewed the flagship This Girl Can film online. The campaign doesn’t hold back in trying to encourage women to beat their barriers. “Sweating like a pig, feeling like a fox” and “I kick balls, deal with it” are among the hard-hitting lines used in the campaign to prompt a change in attitudes and help boost women’s confidence. It comes as research, carried out by Sport England, reveals that by every measure, fewer women than men play sport regularly – two million fewer 14-40 year olds in total. Despite this, 75 per cent say they want to be more active. In other European countries, this disparity doesn’t exist and it is a trend we need to combat. Further research into what’s stopping women turning their ambitions into reality found that a fear of judgement – on appearance, ability or how they chose to spend time on themselves – puts women of all ages off exercising. The findings were the driving force behind the campaign’s creation, which aims to empower women and encourage more women to get active. Through This Girl Can, Sport England and MCSC want to tell the real story of women who exercise and play sport. They come in all shapes and sizes and all levels of ability. They have a myriad of reasons for doing what they do. If you are wondering if you should join them – or carry on – this campaign says it really doesn’t matter if you have average ability or are completely brilliant, the main thing is that you are a woman and you are doing something, for you, and that deserves to be celebrated. Led by qualified, female run leaders and open to beginners and confident, experienced runners alike. Summer rounders league, not experience necessary, just grab some friends or colleagues and have some fun! Different each week, including weights, boxing & circuits. An intense workout to do something for yourself and feel great. Focusing on the basics or riding, safety and maintenance, progressing to forest routes. 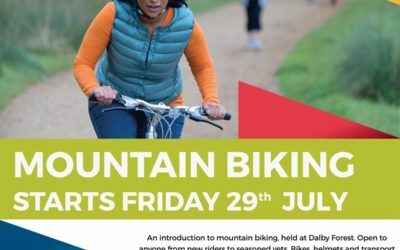 Run in partnership with Dalby Forest. Bikes & transport provided. 10 week taster sessions of indoor climbing . Become confident, skilled and awesome.